The Big Ten released television designations and tipoff times for the league's schools on Thursday afternoon and Nebraska will play on TV at least 28 times in 2018-19. Nebraska will appear on BTN 16 times this season including 13 Big Ten games and nonconference games against in-state foe Creighton on Dec. 8 at 5 p.m., Oklahoma State in Sioux Falls, S.D., on Dec. 16 at 6 p.m. and Cal State Fullerton on Dec. 22 at 1 p.m. The BTN will also broadcast the first three rounds of the Big Ten Tournament with CBS carrying the semifinals and championship game. The Huskers will play on the ESPN family of networks seven times including three conference games (against Penn State, at Michigan and at Michigan State), a nonconference game against Southeastern Lousiana on Nov. 11 at 3 p.m, both games of the Hall of Fame Classic in Kansas City (Missouri State and either Texas Tech or USC) and the ACC/Big Ten Challenge game against Clemson on Nov. 26 at 6 p.m.
FS1 will carry four conference games for the Huskers – at Indiana, against Michigan State, against Ohio State and at Penn State. Tipoff time and network designation for Nebraska's Gavitt Tipoff Games meeting with Seton Hall will be announced at a later date. It will either be on BTN or FS1. The remaining three nonconference games – against Mississippi Valley State, Western Illinois and Southwest Minnesota State – as well as the exhibition game against Wayne State will all be available on BTN Plus. Tickets for Nebraska's game against Oklahoma State at the Sanford Pentagon in Sioux Falls will go on sale on Friday at 10 a.m. at Ticketmaster.com and at Ticketmaster outlets with prices ranging from $48 to $153. A small number of season tickets remain and can be purchased here or by calling the Nebraska Athletic Development and Ticketing Office at 800-8-BIGRED. 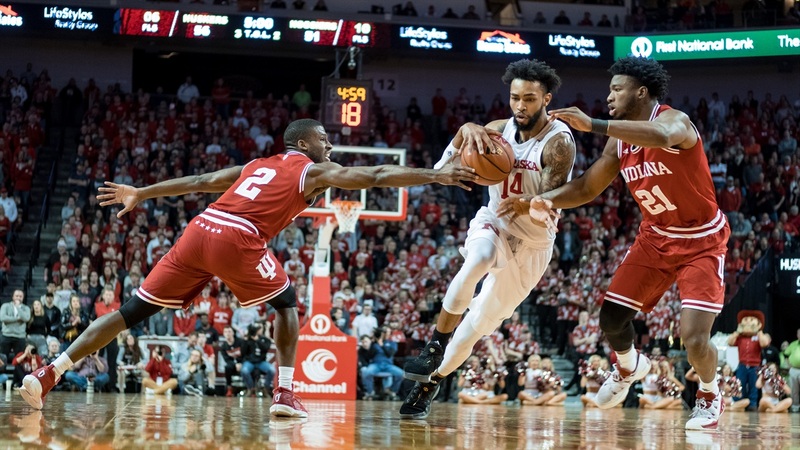 The Huskers are coming off a 22-11 season that saw the Huskers go 13-5 in conference play and qualify for the NIT, and they return their top four scorers including All-Big Ten performer James Palmer Jr.
For a full schedule including tipoff times, head over to Hail Varsity's men's basketball schedule page.